Following on from probiotics and prebiotics, the formulation FlavoFight can be described as the first-in-class flavobiotic supplement. Flavobiotic is a contraction of the words ‘flavonoid’ and ‘microbiota’ and the supplement FlavoFight is indeed formulated from a concentrate of flavonoids beneficial to intestinal microbiota. Part of the large family of polyphenols, flavonoids are known for their antioxidant effects. Some of these natural antioxidants have been shown to have benefits for intestinal microbiota, also known as gut flora, which plays an essential role in our digestive and immune systems. In improving the health and functioning of this microbiota, flavobiotics offer significant potential for enhancing digestive health and boosting the immune system. 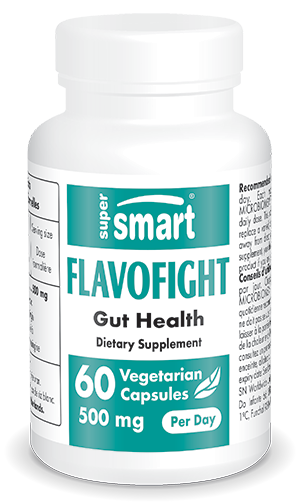 The flavonoids selected for inclusion in FlavoFight have a beneficial effect on intestinal flora. Flavobiotics primarily encourage the production of short-chain fatty acids by bacteria in gut flora. Produced by bacterial fermentation, these fatty acids are then absorbed into the intestinal mucosa where they are used chiefly as a source of energy by intestinal cells. This lipid-derived energy production brings to mind the principle of ketogenesis which in breaking down fatty acids, leads to the formation of ketone bodies such as beta-hydroxybutyrate (BHB) which are then used by the body as an alternative source of energy. FlavoFight’s formulation is based on the findings of several scientific studies. The flavonoids or flavobiotics selected have been shown to have many benefits for the digestive system. By modulating the production of short-chain fatty acids, they affect intestinal motility and are thus able to combat gastrointestinal problems such as diarrhoea. By encouraging production of short-chain fatty acids, such as butyrate or butyric acid, flavobiotics help strengthen the intestinal barrier, reducing the inflammatory response in the gut. This effect has been confirmed by measuring levels of calprotectin, a protein secreted in the presence of intestinal inflammation: flavobiotic supplements were found to reduce levels of faecal calprotectin. As a result of flavobiotics’ anti-inflammatory effect, FlavoFight can be used as an immune-stimulating supplement. The flavobiotics in FlavoFight are obtained from an extract of orange (Citrus sinensis). For maximum efficacy, this extract is standardised in flavonoids to 80% hesperidin and 3.5% isonaringin (MICROBIOMEX®). It comes in vegetarian capsules to capitalise on the extract’s quality, delivering an optimal 250mg per capsule, with a suggested dose of two capsules of FlavoFight a day. This dose can, however, be adapted to your needs and the advice of your therapist. To boost the body’s immune defences, FlavFight can also be combined with other immunity-stimulating supplements such as the probiotic strain Bacillus subtilis, known for its immune-boosting effects. Other ingredients: microcrystalline cellulose, maltodextrin, magnesium stearate.